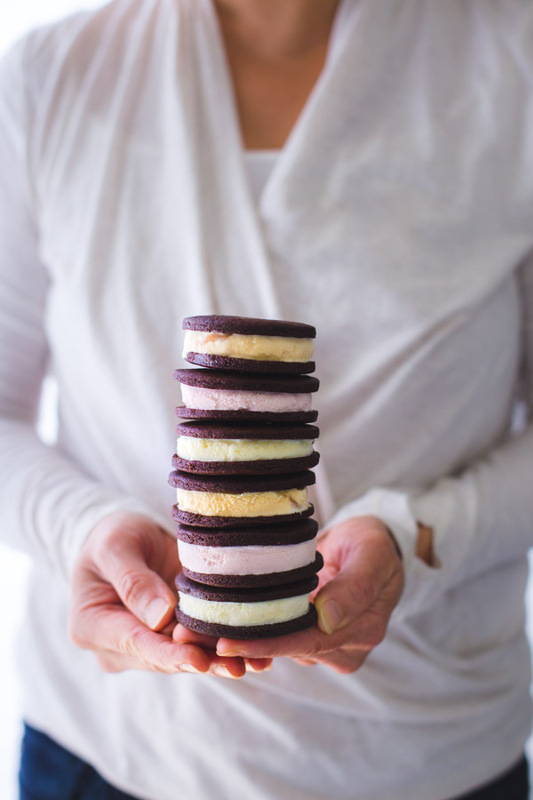 Who’s got time to make homemade ice-cream sandwiches? You do. I swear. 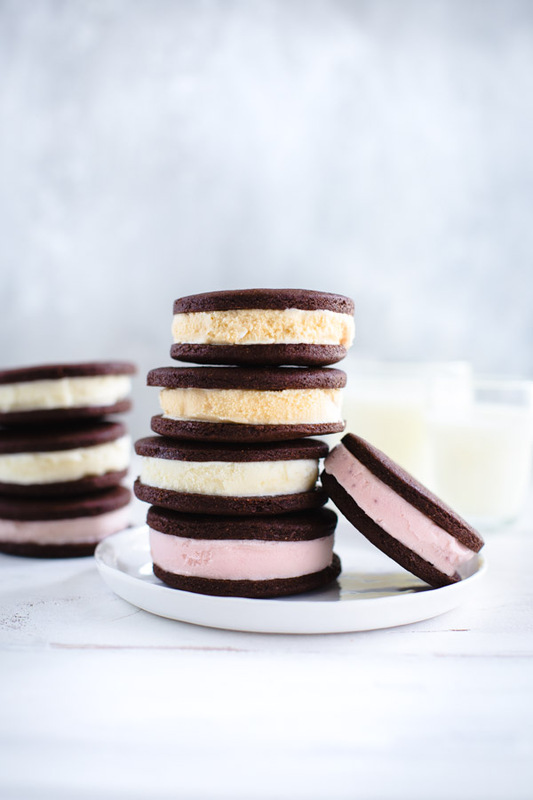 If you have ever baked a batch of cut-out cookies, you can make these semi-homemade ice-cream sandwiches. The key is in the semi-homemade part. 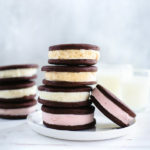 The cookies are baked from scratch but the filling is store bought ice-cream and, using the most clever kitchen hack ever, you can assemble the sandwiches without making a mess or waiting 4 hours to wait for the ice-cream to re-freeze. I have been looking for a homemade version of the classic chocolate cookie and vanilla ice-cream sandwich ever since I read the ingredient list for a store-bought variety and decided there were too many ingredients I didn’t like. So I set out to find an ice-cream sandwich recipe that was easy enough to make AND eat. It turns out that getting the right cookie for a good ice-cream sandwich isn’t as simple as whipping up a batch of your favorite cookie. Let’s face it – most cookies are designed to be enjoyed at room temperature or (even better) warm from the oven. This is great until you want to put ice-cream on it and still be able to eat it with your hands. For an ideal ice-cream sandwich, you need a cookie you can bite into when it’s still frozen and not have all the ice-cream squish out. After trying out several recipes, I think I finally found one that meets all the criteria. There’s a deep chocolate flavor that doesn’t get lost when the cookie is frozen and the cookie is the perfect balance of soft, crispy, and chewy. Given how quickly my husband and kids finished off these ice-cream sandwiches, I think you’ll like them too. Filling these sandwiches is super easy if you use the slicing method. It’s a great hack. Basically, peel the paper away from a small snack size carton of ice-cream. Then cut the ice-cream block into slices and sandwich the slices between two cookies. The ice-cream barely has time to start melting before you’re done and ready to put the completed sandwiches in the freezer. I like to use the small snack size cartons (3.6 ounces) of ice-cream so that I can make mini ice-cream sandwiches. They’re better for snacking with better portion control. Because it’ll be hard to stop eating these once you get started. In a large mixing bowl, beat together the butter, sugar, salt, baking powder, and espresso powder until fluffy, about 3-5 minutes. Beat in the egg and vanilla until combined, scraping down the bowl as necessary. Add flour and cocoa powder and mix on low speed until dough comes together and no more flour is visible. Turn the dough out onto a work surface and divide into 2 equal portions. Shape each portion into a ball, then flatten the balls into disks about 1/2 inch thick. Wrap in plastic wrap and chill until firm, about 30 minutes. When ready to bake the cookies, heat the oven to 350 degrees F. Line two full-sheet sized baking sheets with parchment paper. Set aside. On a work surface, lay down one large piece of wax paper. Remove one disk of dough from the refrigerator, unwrap it, and place on the wax paper. Lay another large piece of wax paper on top. Roll out the dough (between the 2 sheets of wax paper) until it is about 1/8 inch thick or less. Using a 2 1/2 inch and a 2 1/4 inch round cookie cutter, cut out rounds from the dough (see Notes). Slide a small offset spatula under the cut outs to lift them up and transfer them to the prepared baking sheets. Leave about 1/4 inch between the cookies. Gather up and reroll the scraps of dough and cut out more cookies. Repeat with the remaining disk of dough. If dough becomes too soft to work with, refrigerate the dough until it is firm again. Bake the cookies for 10 minutes. Watch them closely so they don’t over bake. If you start to smell chocolate towards the end of the baking time, remove the cookies from the oven. Let the cookies cool in the pans for 2 minutes. Then transfer the cookies to a wire rack to cool completely before filling. Place a large storage container in the freezer so you can place the ice-cream sandwiches in the freezer as soon as they’re filled. Pair up the cookies and lay them out on a work surface. Set aside. Remove one carton of ice-cream from the freezer. Remove the lid and liner from the top of the carton. Using a pair of kitchen shears, snip down the side of the carton. Then peel away the carton. Place the block of ice-cream on its side on a cutting surface. Using a sharp knife, cut the block into 3 equal slices. It’s easiest to just press down on the ice-cream with the knife rather than using a slicing motion. Place the ice-cream slices between 3 cookie pairs and place completed sandwiches in the freezer. Repeat with remaining ice-cream and cookies. I use the 2 1/4 inch cutter to cut out about a third of the cookies and use the 2 1/2 cutter for the remainder. This is because the ice-cream pints have slanted sides so I know some slices will be smaller and will fit better in the 2 1/4 inch cookies. This is totally optional – you can cut all the cookies to be the same size. Note the size of the ice-cream cartons. They are the small “personal” or “snack” size cartons. Recipe for cookies from King Arthur Flour.